Nepean Cancer Care Centre (NCCC) was established in 1998, setting up a comprehensive specialised interdisciplinary allied health team to support the care needs of the cancer patients throughout their cancer journey. Allied health services are experiencing the demand of a growing cancer care service. The overall occasions of service have risen 7% annually over 14 years and allied health staffing remains constant resulting in reducing the service to a crisis response. This project is working to ensure the most efficient, effective use of allied health resources to support the best patient journey. To deliver a sustainable innovative interdisciplinary team approach, improving access to allied health services to meet the needs of cancer care patients and carers and improve quality of life. All NCCC health staff can refer high priority cancer patients to different allied health outpatient clinics or home visits appropriately. Improved care coordination and patient journey. Patients will be better informed about services that can be delivered by the comprehensive allied health cancer care service, and how these services will improve their journey. They will be informed early to know how and when to access the services appropriately. Efficient and effective use of allied health resources. The allied health oncology specialty team at the NCCC currently operates independently from their professional departments. This comprehensive interdisciplinary service was established to support the care needs of the cancer patients throughout their cancer journey. The allied health service has experienced increasing demand across the outpatient and inpatient setting over the last 14 years. Since the NCCC opened the overall occasions of service have risen from 19,000 to over 46,000 per year - an average of 7% growth per year. Due to the increase in clinical workloads, sole clinicians within the allied health team need assistance from their individual departments. This has contributed to a 'silo phenomena' that compromises multidisciplinary team work. In order to maintain the allied health inpatient demand the NCCC allied health outpatient service has been reduced and outpatient clinics are experiencing long waiting lists. Allied health group sessions for cancer patients have been cancelled and occupational therapy home visits are limited. Formal education sessions to promote the service to staff and patients have also ceased. Inpatient referrals are prioritised over outpatient referrals but are also delayed resulting in longer length of stays, access block or patients being discharged without any allied health input or follow-up. Currently patients attending NCCC for treatment have no easy access to allied health services. This contributes to more crisis inpatient referrals hence called the 'Band-Aid effect'. Without allied health support cancer patients’ quality of life can be poorly affected due to risk of physical, psycho-social decline and worsening malnutrition. The allied health team recognise the reality in current budget constraints in a growing population and are not proposing the solution to this problem is more allied health staff, but to investigate, identify and implement changes to improve the current cancer patient journey. Improved leave planning and cover for all NCCC allied health outpatient services to ensure patient care remains safe and of high quality. This will help ensure NCCC allied health staff do not experience the increase workload before and on return from annual leave. Standardised allied health referral process will include community occupational therapy home visits. This will reduce staff confusion on the process of referral to ensure consistency in processes across disciplines and reduce duplication. This will be adapted to the future electronic record system ensuring referrals can be done online. Prioritisation of all allied health referrals across all disciplines within the NCCC allied health setting to ensure patients are seen on time and to prevent previous 'crisis management'. NCCC allied health information brochure to inform patients and carers of the multidisciplinary approach to their individualised care and the services available. In-services to new staff around the NCCC allied service and referral process quarterly. Access to chime (current community e-record database for all new review assessments and appointments) for NCCC allied health staff. This ensures efficient communication between community services. Standardised referral form has been developed and implemented for allied health clinics in conjunction with the prioritisation chart. Development of a standardised referral form for NCCC occupational therapy home-visits and implemented over the district. Development of an allied health brochure. Orientation package for health staff, patients and carers has been developed. NCCC allied health assistant to support clinical demands and reduce the non-clinical workloads of senior clinicians. Process to facilitate inpatient referrals that can be seen in outpatient clinics. SMS/text message to confirm and remind appointments. Agency for Clinical Innovation, Centre for Healthcare Redesign. Implementation of the priority referral criteria (high, moderate or low) for all outpatient referrals to NCCC across all allied health disciplines. 100% of high priority patients are being seen within one week of referral. Average waiting time for NCCC outpatient clinics are between 1-3 weeks, previously 2-6 weeks. Target = 1-2 weeks. Average 'did not attends' are 16 per month for NCCC outpatient clinics post implementation versus 24 per month prior to implementation. Target = 12 per month. Average cancellations for NCCC outpatient clinics 28 per month post implementation versus 32 per month prior. Target = 16 per month. 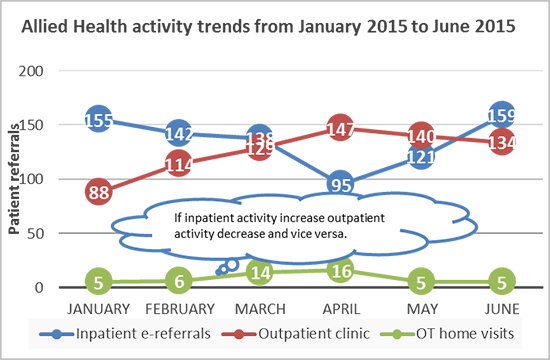 If inpatient activity increases outpatient activity decreases and vice versa. Following and mastering the Redesign methodology. The benefit of a supportive sponsor who provides expert advice and empower us to successfully complete the six phases of the project. Managing resistance: passionate project managers do not always guarantee smooth change implementation. Forming change agents and identifying and using champions was essential. 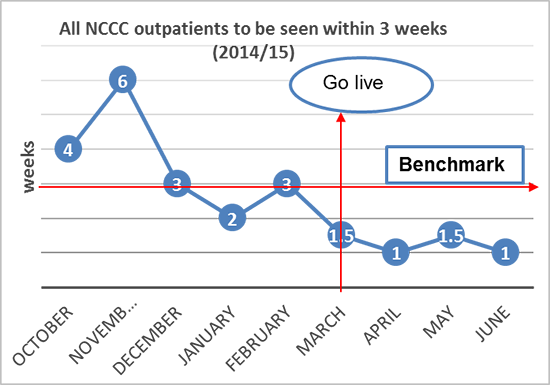 Following the Accelerating Implementation Methodology was a great guide. Getting and keeping accurate data for the current allied health service was challenging but important. It is now the norm and will assist in sustaining change with monthly reports to NCCC management. Identifying and acknowledging different personality types and learning styles was useful in the ongoing change management. 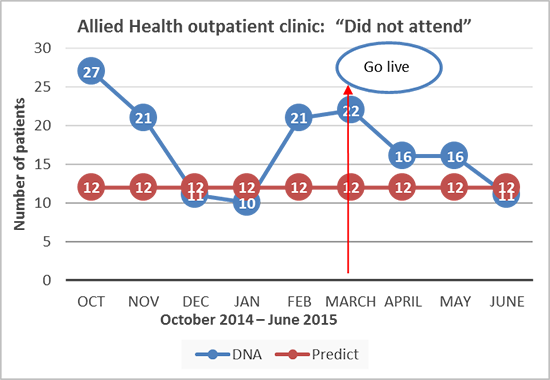 Managing risks and issues with clear mitigation plans. Prioritisation: we focused on getting the most important tasks done first and avoid scope creep.